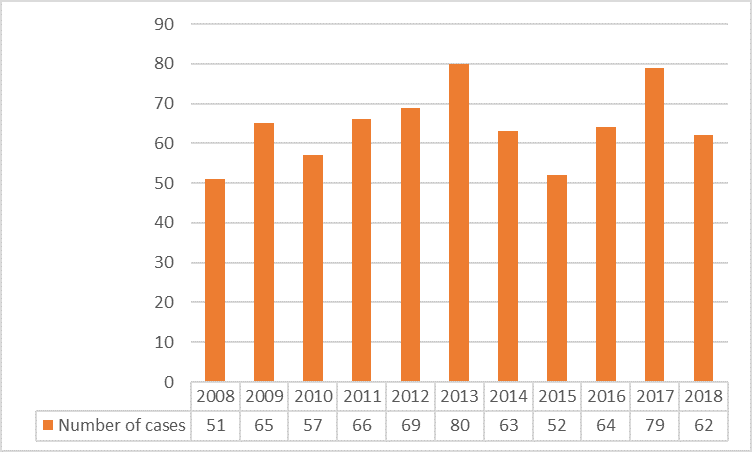 Picture 1 below shows the number of cases filed with the FAI from 2008 through 2018. Fast proceedings: As can be seen in Picture 2 below, the median duration of FAI arbitrations and FAI expedited arbitrations is consistently within the time limits set in the FAI Arbitration Rules and FAI Expedited Rules for the rendering of the final award, i.e. 9 months and 3 months, respectively, although extensions have been requested and granted in some complex cases or pending settlement negotiations. The, by international standards, short duration of FAI arbitrations may probably explain why FAI arbitration users have not seen a need to use expedited arbitration more often. As in previous years, in 2018, most of the cases were administered under the FAI Arbitration Rules (89%), while only 3% of the cases were administered under the FAI Expedited Rules. Ad hoc arbitrations—where the FAI was merely called upon by the parties to nominate the arbitral tribunal—accounted for 8% of all the cases. In 2018, no mediation cases were filed. Picture 2 below shows the general case statistics for the period 2014-2018. Provisions concerning multi-party and multi-contract proceedings are used to a certain extent: Like in previous years, an important number of FAI arbitrations involved complex disputes, including many multi-party and multi-contract proceedings. Since the adoption of the 2013 FAI Rules, the FAI has received 10 requests for consolidation: eight of these were accepted and two denied. In four cases, all parties to all the arbitrations specifically agreed to and jointly requested consolidation. In 2018, two applications for consolidation were filed and granted. Only one request for joinder has been filed with the FAI. More diversification in the subject matter of disputes: Compared to previous years, in 2018, more diversification was seen in the subject matter of disputes filed with the FAI. 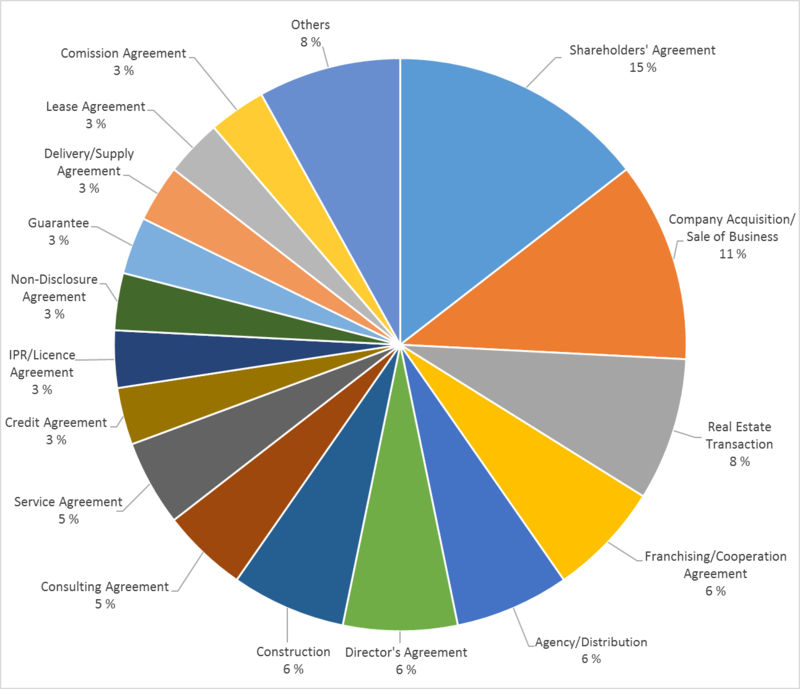 The top three categories of disputes were disputes relating to shareholders’ agreements (15%), company acquisitions/sales of business (11%) and real estate transactions (8%), followed by disputes relating to franchising and cooperation agreements (6%), agency and distribution agreements (6%), director’s agreements (6%) and construction agreements (6%). 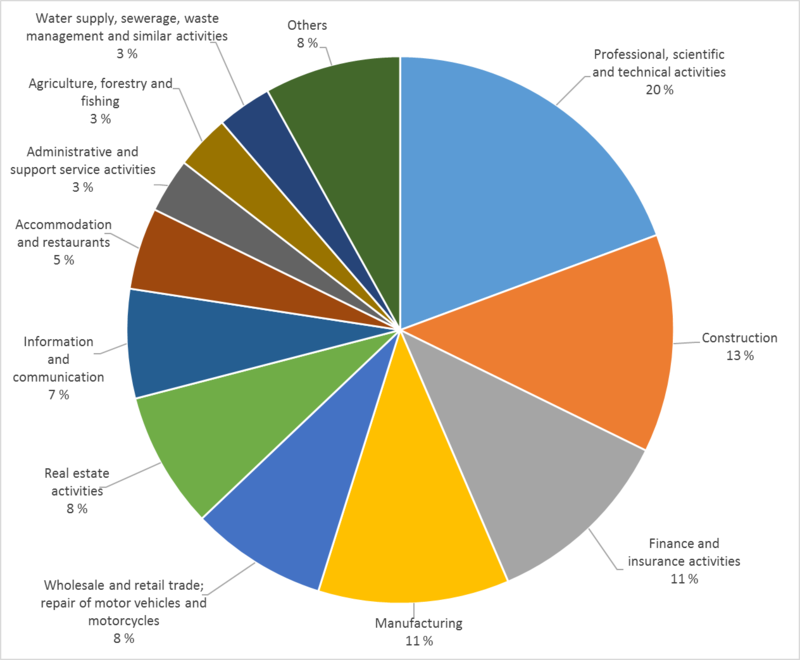 Moreover, 55% of the disputes related to the following sectors: manufacturing (11%), finance and insurance (11%), construction (13%), and professional, scientific and technical (20%). For a full overview, please see Pictures 3 and 4 below. Consistent share of international cases: In 2018, the share of international cases (in which at least one of the parties is not Finnish) continues to be approximately one third of the total caseload (29% in 2018). 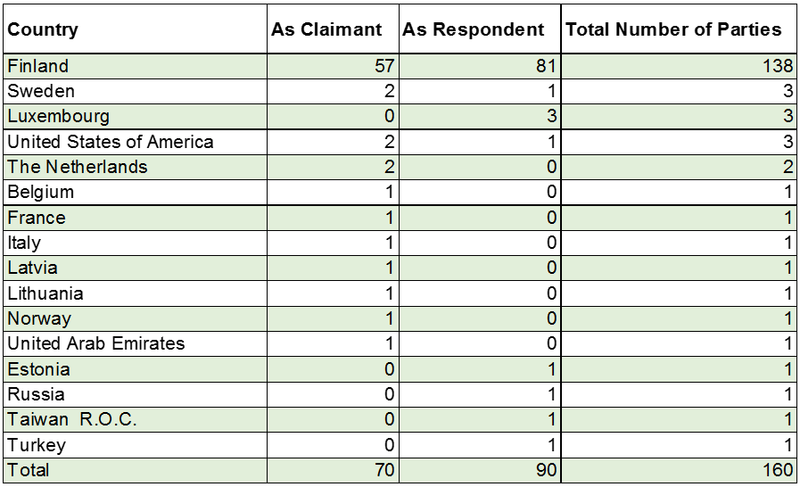 For an overview of the nationality of the parties involved in FAI arbitrations, please see Picture 5 below. Confirmation of Arbitrators: In 2018, the confirmed arbitrators included Finnish, French, German, Lithuanian, Swedish and Swiss nationals. According to the FAI Rules, all nominations of an arbitrator made by the parties or party-appointed arbitrators as well as the appointments by the FAI Board are subject to confirmation by the FAI. Since the adoption of the 2013 FAI Rules, the FAI has made more than 350 decisions on confirmation. In 19 cases, one of the parties objected to confirmation. The FAI Board was called upon to decide the objection in 12 cases; in seven instances, the arbitrator candidate voluntarily withdrew. Objections were dismissed in 11 cases and sustained in one. After the objection procedure was introduced in the FAI Rules, there have only been five challenges to an arbitrator. Two challenges were denied on the merits; one was denied without examining the merits as it was filed after the sole arbitrator had already rendered the final award; one was not decided because of the termination of the proceedings; one was sustained. FAI continued to fulfill its commitment to gender diversity: During 2018, the FAI continued with its tradition of equal appointment of male and female arbitrators, a long-lasting commitment to gender diversity reaffirmed in 2016 by the signing of the Equal Representation in Arbitration Pledge, a global initiative to promote gender diversity in arbitration. The drop in the share of women arbitrators—15% in 2018, while 29% in 2017—can be explained by conflicts of interest and lack of availability of several female arbitrator candidates contacted for appointments. As in previous years, more gender diversity was observed in appointments/nominations made by the FAI Board (15% of the appointees/nominees were female) than in nominations made by the parties (6% of the nominees were female) or party-nominated co-arbitrators (no female nominees). Below you will find a brief overview of the FAI’s news and activities in 2018. You may read more from the FAI News section on our website. Following Mr Mika Savola’s resignation as chair of the FAI Board, effective as of the end of March 2018, the Finland Chamber of Commerce appointed Ms Petra Kiurunen (Lindfors & Co Attorneys, Helsinki) as new chair of the FAI Board starting from 1 April 2018. Ms Kiurunen was formerly vice-chair of the FAI Board. You may read more on this topic here. Several anonymous case commentaries were published on the FAI’s website. Addressing landmark decisions by the FAI Board and arbitral tribunals in actual FAI cases, they constitute a valuable source of information to FAI arbitration users. Next autumn, the FAI endeavors to publish several M&A related case commentaries on its website—certainly a topic of interest to many FAI arbitration users. The FAI continued to streamline and optimize its case administration procedures, including gradual digitalization of its operations—a project that will continue in 2019. The ongoing digitalization project aims to provide FAI arbitration users with a secured and user-friendly system to communicate with each other during arbitration proceedings. More information will follow during the course of this year. The German translation of the FAI Rules and FAI Expedited Rules was published on the FAI’s website aiming to better serve German-speaking customers. The next translation project concerns the FAI Mediation Rules, which will be published in Russian soon. The FAI showcased its legal design project at the Helsinki International Arbitration Day 2018: the FAI Arbitration Process flowchart. The flowchart—posted on the FAI’s website—aims to provide arbitration users with a one-stop tool to quickly grasp the entire FAI arbitration process. A similar process flowchart has now been prepared for the FAI mediation process. You may learn more about our legal design journey here. In December 2018, the FAI announced that several internationally recognized arbitration experts were to join the FAI Board for the term beginning on 1 January 2019. For more on this news please read the FAI’s press release and the Global Arbitration Review’s article on the topic published on 6 February 2019. The FAI has continued with its practice of overseeing the quality and efficiency of FAI arbitrations. All FAI awards are carefully reviewed, once rendered, by both the FAI Board and Secretariat. Likewise, customer feedback on the performance of arbitrators and the FAI’s case administration is diligently taken into consideration to improve the FAI’s services. We invite arbitration users—amongst them, parties to a dispute and their counsel—to take the time to give us their feedback, for it is an invaluable source of information to improve our services, including the appointment of high-quality arbitrators. In 2018, the FAI Newsletter continued to keep FAI customers abreast of the FAI’s most import developments including e.g. its latest news, events, activities, articles and case commentaries. The FAI’s seminar and discussion on the “Need for Revisions of the Finnish Arbitration Act” at the beginning of 2018. As you may read from the seminar report, the Finland Chamber of Commerce submitted a proposal to the Finnish Ministry of Justice calling for a reform of the 1992 Finnish Arbitration Act. The Finland Chamber of Commerce also handed over to the Ministry of Justice a signed petition for the reform of the act that was signed by more than 200 business representatives. The Ministry of Justice held a hearing on the need for the reform of the Act in September, after which it called a public hearing on the matter. During the public hearing, nearly 40 statements were submitted to the Ministry of Justice. Now, the Ministry of Justice has assessed the statements received during the consultation period and found that there is a need for the revision of the Arbitration Act. The revision process of the Finnish Arbitration Act will be launched during the current government term, ending in April 2019. For more information please read our press release. Helsinki International Arbitration Day 2018 (HIAD 2018) on the topic “Shaping the Future of International Arbitration” held in Helsinki in May 2018. The conference, now in its seventh edition, gathered leading international arbitration experts from Finland and around the world to discuss about the future of international arbitration and how dispute resolution can be tailored to continue to meet the users’ expectations of speed, efficiency and use of technology. You may read more about HIAD 2018 in the conference report published in Kluwer Arbitration Blog. Should you wish to take a look at the conference material, photos and videos, you may access them here. The Finnish Arbitration Academy held for the fifth time in the autumn. So far, the Academy has provided more than 140 Finnish legal practitioners with the necessary tools to effectively participate in arbitrations as counsel or arbitrators in accordance with current best practices and standards. You may read more about the Arbitration Academy (in Finnish) here. Further, during 2018, the FAI visited companies, law firms and other organizations, and met with other arbitral institutions, with a view to sharing and exchanging thoughts on developments in international arbitration. As an example of institutional cooperation, in June 2018, top experts from China and the Nordics gathered in Stockholm for the “Nordic Summit on Commercial Dispute Resolution in China”. Held for the first time in the Nordic countries, the Summit was a collaboration between the Beijing Arbitration Commission/Beijing International Arbitration Center, the Arbitration Institute of the Stockholm Chamber of Commerce, the Danish Institute of Arbitration, the Arbitration and Dispute Resolution Institute of Oslo Chamber of Commerce and the FAI to discuss about commercial dispute resolution developments in China. For more information about the FAI’s events please visit our website. 2019 has started with high activity at the FAI, with ten new cases filed in January. We have several interesting projects planned for 2019: as earlier mentioned, digitalization of the FAI services, and the assessment of the need to revise the FAI Rules. Stay tuned for more information. As in previous years, the FAI will be hosting, co-hosting and participating in different events during the current year. Amongst them, the FAI is honoured to host the 15th IFCAI Biennial Conference on the topic “Roles and Responsibilities of Key Stakeholders in Conflict Resolution – Finding the Right Balance to Maximise Strategic and Effective Conflict Resolution” in Helsinki on 23 May 2019. The IFCAI Biennial Conference is an international arbitration conference arranged every two years by the International Federation of Commercial Arbitration Institutions (IFCAI). The conference is hosted in turns by arbitral institutions that are IFCAI members. You may visit the event site and register to the conference here. As you may see from the programme, we are delighted to welcome in Helsinki many institutional representatives, distinguished international arbitration and mediation practitioners and general counsel to speak at the conference. We hope to meet you in Helsinki in May! For more information about the FAI’s upcoming events and other activities, please visit our website arbitration.fi and follow us on LinkedIn and Twitter (@FAIarbitration). You may subscribe to our mailing list (and to receive the FAI Newsletter) here.